Despite widespread political censorship and crackdowns by the Erdoğan regime, Ahmet Altan bravely crafts a novel about the ways in which corruption envelops contemporary Turkish life. Endgame is an atmospheric and enigmatic literary noir, in which an unnamed writer visits a small town and finds himself involved in a mystery with existentialist implications. A womanizing writer who has lived his entire life in the city retires to a sunbaked Turkish village. Instead of the quiet life he hoped for, he encounters a world of suspicion, paranoia, and violence. The town's mayor is both his only real ally and his greatest nemesis; his lover shares an ambiguous past with the mayor; the town seems hell-bent on turning him into a murderer; and, he is initiated into the town's biggest secret only to discover this knowledge will become a weapon used against him. The protagonist of this bestselling existential page-turner is an appealingly untrustworthy narrator whose story transports the reader into a world of lust, ambition, small-town politics, and death. 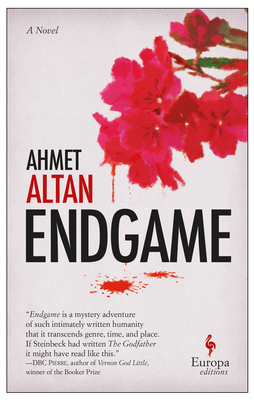 A detective story turned on its head, Endgame is compellingly infused with a dreamlike logic reminiscent of Paul Auster and Graham Greene. Ahmet Altan, one of today’s most important Turkish writers, was arrested in September 2016 for his work as a journalist. An advocate for Kurdish and Armenian minorities and a central figure in the Turkish cultural world (Nobel Prize winner Orhan Pamuk has written about his arrest and signed a open letter calling for his release), he is the author of five successful novels. The first, published when he was twenty-seven years old, won the Grand Prix from the Akademi Publishing House. In 2009 he received the prestigious Freedom and Future of the Media Prize from the Media Foundation of Sparkasse Leipzig and in 2011 he received the International Hrant Dink Award. The international bestseller Endgame is his English-language debut. "A gripping existential thriller in the vein of Vikram Chandra's Sacred Games (2006)." "Atlan's work is at once atmospheric and distant [...]. Each of the threads are artfully crafted and do come together nicely by the end, as promised. Altan's characters are, at times, difficult to penetrate, but his story is pointed, enigmatic, and difficult to forget." "Endgame is a rare beast: a mystery adventure in the age of internet, of such intimately written humanity that it transcends genre, time and place. If Steinbeck had written The Godfather it might have read like this." "Endgame is deeply political. It is populated by characters who try to grab that hypothetical treasure on the hill and in so doing tear their local paradise apart. Altan has a deep understanding of what drives them on. It is all very serious but also great fun." "A deeply compelling and immersive narrative about love, desire, loneliness and landscape. Ahmet Altan is one of the foremost voices in Turkish literature and has much to say to the world." "Altan pushes the tropes of detective fiction into existentialist territory." "An impassioned, captivating dance, a waltz between death and desire that does not release you for even a single moment." "Endgame is a complex and immensely readable book—insightful, disturbing, irritating and riveting."